Collaborations: Susmit Sen (left) with his sound designer at Indian Ocean’s New Delhi studio. Photo by Ramesh Pathania/Mint. 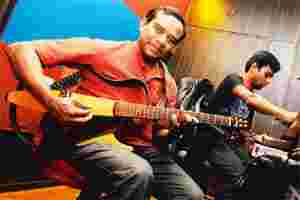 In 27 years, this is the first time any of us has done something on his own," Susmit Sen, guitarist and band member of Indian Ocean, says about Depths of the Ocean, his first solo album, which released on Tuesday in New Delhi. Those Indian Ocean decades have made it difficult for him to say when this new album even really began: Were the seeds of it sown before the band ever came together? Was it developing even as Sen was putting out those definitive albums, touring the country and then the world, and creating a new sound with one of the most famous groups in Indian music? Sen is self-taught, and says that what draws him to a classical piece is the meditative effect of a performance. Some of this is evident here: The sound of Sen’s guitar is clean, but not pure. Many of the pieces are long by popular standards; their progressions recall the unfolding of a raga, though Sen’s guitar itself is not classical in sound or method. The title song, which features Parikrama’s Nitin Malik, Gaurav Sajjanhar, Sudhir Rekhari and Anuradha Sajjanhar, is over 10 minutes long; City Lights, featuring a wonderful Shubha Mudgal performance, is over 11. All of them command attention from the beginning. The melodies are quiet adventures because of Sen’s aversion to repetition, and some passages of play are dazzling. Sen’s solo guitar track, Tribute, is perhaps its most moving piece, especially in its quiet, echoing early passages. There are sections—particularly on the vocal collaborations—which walk a thin line between mood and atmospherics. But there are enough moments on the record that make your spine tingle. “I was fortunate enough to grow up in a time when I heard the great masters of classical music," he says. “Ali Akbar Khan saab, Pandit Bhimsen Joshi, Mallikarjun Mansur. One of the best things that happened to me recently was falling asleep in a room listening to Nikhil Banerjee and waking up to it the next morning." 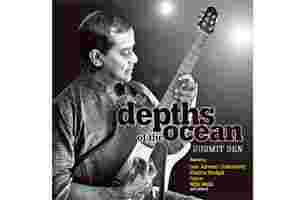 Depths of the Ocean: Susmit Sen, on CD from EMI, Rs350. All of Sen’s music on this album is a conversation with his collaborators. He calls on a range of artistes, “brilliant musicians and brilliant human beings", in Sen’s view. They play, led by his guitar, and sometimes engage in the sort of back-and-forth which characterizes the jugalbandi. This is not unequivocally dazzling: While City Lights with Mudgal and Rejuvenation, featuring the late Indian Ocean lead singer Asheem Chakravarty, are delights from start to finish, there is more predictability in his collaborations with artistes like Papon and Sari Roy—outstanding singers in their own right, but less attuned, at least on early listens, to the sort of improvisation that Sen pulls off so well on the other songs. He even presents an interpretation of Jana Gana Mana, a small beauty called Six String Salute, which somehow relieves it of its patriotic burdens, and becomes a simpler, sweeter riff on Rabindranath Tagore’s music. “I started thinking of recording in October 2009, when Indian Ocean finished a long tour," Sen recalls. “Then Asheem fell ill. After his death in December, the next year was just about keeping Indian Ocean together and on the road." Finally, earlier this year, with a new studio in Delhi’s Lado Sarai and some spare time, he found the musicians he wanted to work with, headed into the recording room while it was under construction, and started to play the songs that have been in the making for all these years.